I went up to the North Shore of Lake Superior earlier this week. I brought a visitor who had never seen the lake, and this was the time he could go. He’s from another country where there are no fall colors, so I was hoping to find some changing leaves. 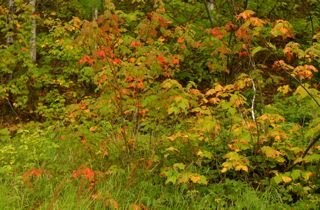 It’s a little early yet, but I figured the maples would at least be starting to turn. Waiting another week or so would have been better, but this is the only time he could fit in the daylong journey. There was very little color on the drive up, and not much along the North Shore, either. There were a few trees here and there that were starting to show color. Finally, as we made the drive to Palisade Head just north of Split Rock Lighthouse, we ran across a little more color, at least enough to give him some idea what the fall colors are like. He loved it. I pulled over and we both got out of my car and pulled out our cameras. We snapped away for about 10-15 minutes, then went on to Palisade Head for a spectacular view of Lake Superior. It’s the highest point on the North Shore and you can see for miles out onto the lake from atop this majestic cliff. Even without the colors, the view was worth it. Starting this weekend, the fall colors will start to spread from north to south across the state. The first to turn are the maples inland from Lake Superior. Then, about a week to 10 days later, the birch and apsen trees turn brilliant shades of gold and yellow along the shore. From there, everything proceeds south, ending in southeastern Minnesota the second or third week in October. For those with the time and ambition, there is about a month’s worth of fall colors to enjoy. I used to go to the North Shore every year in late September or early October. But, life got busy. I sure would like to go again in another week. What fun it would be to spend several days surrounded by beautiful colors. I can’t think of a better way to enjoy fall.